17 years ago, as a recent graduate of the Fine Art Photography at the University of Akron I had a problem. With degree in hand I had no more class critiques to work toward. Senior projects all wrapped up. Working at Dodd Camera in Cleveland and then later as a photo assistant in the area. Though I was working in my profession I had to get out and photograph for myself. Personal work as it would be called by career coaches. Except my personal work was truly personal, not just spec work made to get the attention of agencies. I continued to work like a student and make a dozen images every other week. Quickly a pattern emerged, weekends with good wether, old commercial areas of towns and cities, and midday light because I had to travel in the morning to the areas I photographed. In 2011, as a new resident of northern Utah and with only part time work I continued this pursuit with fresh eyes placed on towns I had not seen before. A collection of these images are on display at Gallery East in Price, Utah through December 8th 2017. The gallery is in the new Fine Arts Center at USU Eastern, a regional campus of Utah State University. Since many if not all of the viewers of this blog will not be able to see the show in person, I’ll share some images here on the blog. Above: Idaho Falls, Idaho 2014. The post card image for the show and one of the best images to some up the show title. I went to Idaho Falls specifically to wander around it’s old commercial district and see what I could find and the above image I like to think of as a gift from the photo gods. A perfectly clean ally sets up a single point perspective with many hard lines and a beautiful shadow. The order and tension is broke by the twisted power pole and its diagonal shadows in the center and the minimal intrusion of leafless trees and pitiful clouds. The image modulates between looking deep due to leading lines and flat due to limited tonality. Above: Malad, Idaho 2014. The documentarian photographer works like a hunter gatherer, with a list of suitable subjects in their head and ideas as to how they would like to order them. In the case above the image was shot for a collection I call Silo Survey. Recently I have started to merge parts of that collection into my Towns Less Occupied series. Like the image from Idaho Falls, this image revels in detail and the play of order and disorder. Mostly vertical lines with a few horizontals, mostly tin with a few wood planks. Unusual for me is the time of day but in this case the warm summer light adds to the overall success. I’ll continue showing images from this show in the next few posts. Not all of them are as hard lined as these two I have talked about today. Photographers are always curious about what you used to make the picture. Both of the images in this post were captured with a 24mm perspective controlled lens on a Nikon body. The image from Idaho Falls I was using a tripod at normal eye height and the Malad image above I was using a giant tripod and standing on a small ladder. Both images were processed in Capture One Pro with the major adjustments being lessening contrast and shifting the blue sky to a slightly pail tone. As a new westerner and a photographer interested both the fantastic natural landscape and the urban setting, I am drawn to the work of a certain mural artist who was prolific in some of the areas I have visited. Initially I saw some humor in the real tree being contained and the mural, an imagined landscape, being available. Years later I noticed that the newer mural stops where the fence is and an older mural exists on the back part of the building. I photograph urban setting generally on Sundays when most business are closed. This helps me obtain a clean, clear view. As does picking pleasant weather. This spring I need to visit Pocatello again and will be sure to include a day when this bar is open so I can check out the older mural and maybe find out who the artist is. In my travels north of Logan, Utah I come across the work of mural painters who had a good business of painting fantastic western landscape murals on various commercial buildings in Southern Idaho. Along the way I have started collecting them when I find them. Intersting commercial building that has seen many years and various uses. Looks as if at one time it was an auto parts store with it’s interior walls painted in a yellow and blue scheme (NAPA?) and a Monroe shocks sold here sign. Currently looks to be someone’s workshop. Buildings like this are part of the reason I enjoy photographing small western towns. If you know anything about this or other building in Bancroft please leave a comment. Below is a detail of the doors and window. This was a year of looking, learning and contemplating. If I had to choose just one image to represent 2013 it would be this image of a mountain goat on Willard Peak in Northern Utah. I took the photo on a drive to Inspiration Point with a photographer friend who shoots pictures of wildlife. Unlike earlier trips when I looked at animals through binoculars, this time we hiked to the mountain goats and saw them at close range. I look forward to doing more of this in 2014. Technical info: Willard Peak via National Forest Road (starts in Mantua) to Inspiration Point. Accessible in warm months by automobiles with high clearance. The last few turns are at over 9000 feet elevation and exposed. Not for the faint of heart. Lone teenager at Delicate Arch in Arches National Park. Any year when you get to visit Moab six times is a good year. The area offers so much to explore and so many photographic possibilities that it boggles the mind. Now that I can go there frequently, I have the luxury of not feeling rushed or compelled to fill the day with a million must-see things. Ghost Rocks viewpoint looking toward the Hunter Power Plant. This photo was taken on a solo winter trip to photograph the area. It was nice to experience Southern Utah at a slower pace and find new locations like this. The quickest way from Moab to SLC is through Price, but a winter storm made travel over Soldier Summit questionable so I took I-70 across the San Rafael Swell and saw a new part of the state. Phone Home on the Range. Last spring I had the opportunity to travel the Kokopelli Trail on a Cruise Moab pre-run. A friend was writing a review of an off-road trailer so I came along to document the run. This great trip gave me access to some amazing country that is not accessible with my stock 4-wd vehicle and I got to meet a group of off-road travel enthusiasts. The view from here to the East Tavaputs Plateau–the ridge line in the distance–is more than 40 miles. In 2012 I wrote about a grain elevator in Preston, Idaho that burned down and how it seemed to have changed the identity of the town. 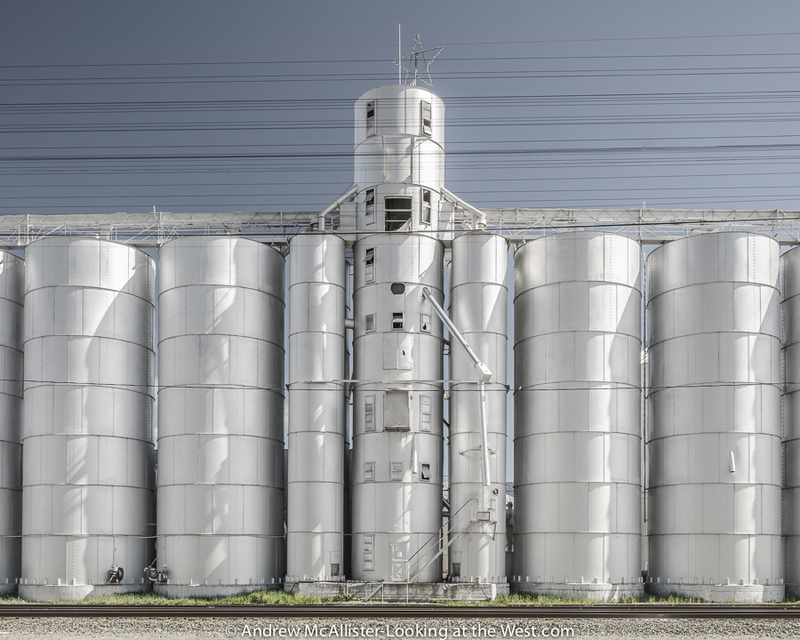 This year I explored this idea and created a series of images documenting grain silos in small towns within a few hours of Cache Valley, Utah. The image above is from Soda Springs, Idaho. More images from the series can be found on my website. 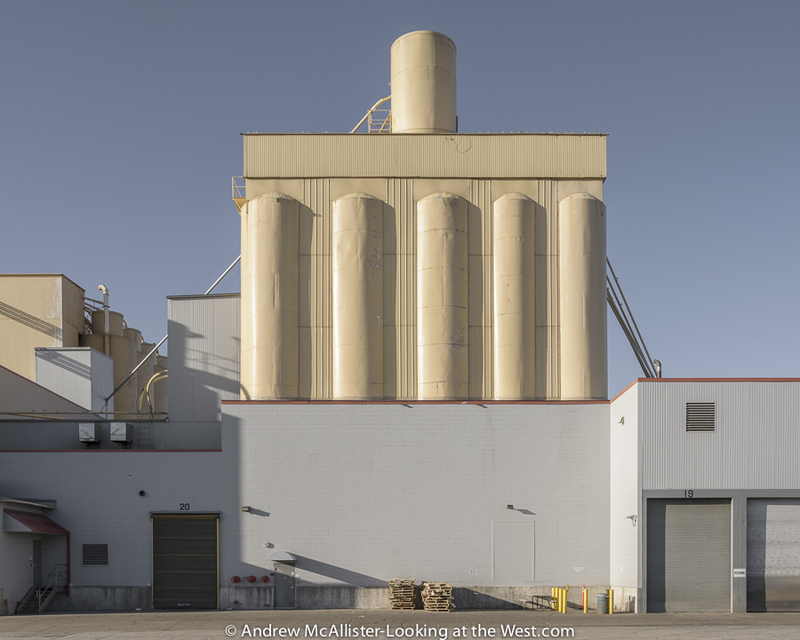 The series on grain elevators led me to industrial areas of towns and other sites like this at American Nutrition in Ogden, Utah. The dramatic light and shadow from the late afternoon sun bring out the structural beauty in this otherwise mundane industrial facility. 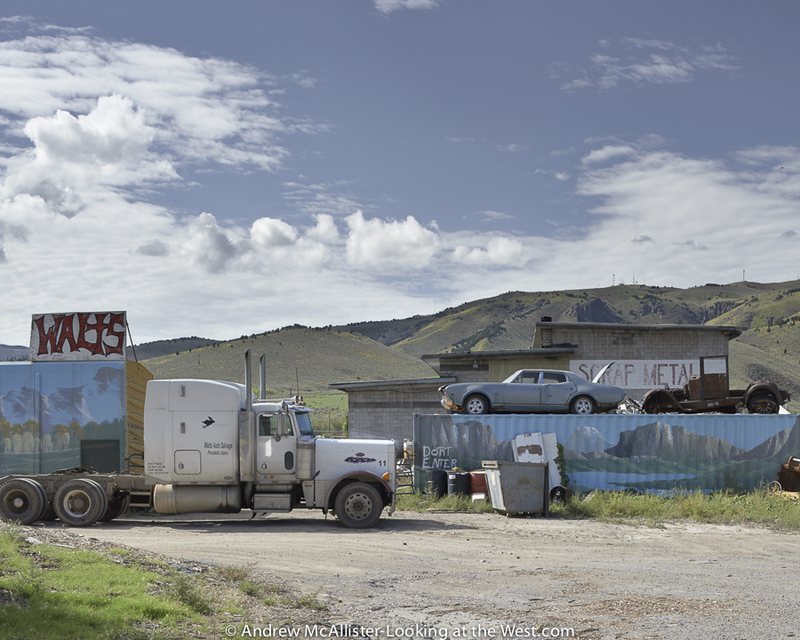 My search for silos took me north to Pocatello, Idaho, where I came across Walts Scrap Metal. It may not speak to everyone, but it interests me because of the play of the flat surfaces depicting western scenes against the actual western landscape. Additionally, the compression of space and the illusions it creates is a kind of puzzle and you have to really look at the photo to pull the different elements apart and try to make sense of the image. Scenes like this make the hours of driving worth it to me. On a return trip to Utah from Denver I crossed the continental divide via Rocky Mountain National Park’s Trail Ridge Road. I had just completed a Phase One Capture One training event and was delighted to come upon this dramatic scene. As I mentioned, 2013 involved a lot of learning and looking. When not photographing I spend a lot of time looking at the world via Google Earth. Last year I took advantage the opportunity to look down from an airplane window in Iceland: the location is somewhere between Reykjavik and Akureyri. Shelf road leading out of Spring Canyon. From my sixth and final Moab trip of 2013. I hope you enjoyed this short review of my 2013 photographs and if you have a similar post about your past year’s adventures please share a link in the comments section. Happy travels and pleasant photography for the coming year!